Staff working in the public sector (Government, Local Government and Agencies) –are – for the main part – working on very similar agendas. Ultimately to deliver more efficient, more effective and better value services for citizens. However, more often than not the staff are isolated within their own departmental environments, with little or no connectivity between systems for sharing knowledge and information. Policies and security restrictions conspire against individuals that attempt to engage with the rich conversations happening across various social networks, where in fact many of the people (citizens) they are striving to serve may be discussing the quality of the public services being delivered. A new approach is required which enables seamless integration and aggregation of knowledge and information. The Knowledge Hub is a revolutionary new platform for communication and collaboration. It will bring people together in one place online to share ideas, knowledge and information more easily, bringing conversations, data and applications (apps) together in a secure and trusted environment. Users will be able to find peers and experts who share their interests, to help each other and develop how they work. It will be a much more coordinated and dynamic way of using social media. More than just an IT solution, the Knowledge Hub is a far-sighted social media resource that could lead to a major cultural change in the public sector – and beyond! It is in fact a cultural and technology framework fit for 21st century government. Local government in England and Wales (UK) employs a vast workforce of 2.1 million people across 367 local authorities. Each authority is working to deliver the same 700 services to their residents. The distributed nature of the sector is unfortunately conducive to ‘silo’d’ working; many local authorities function as stand-alone organizations, isolated from their counterparts across the country that are facing parallel tasks and challenges. The Local Government Communities of Practice Platform was developed early in 2006 as part of a wider knowledge management strategy review undertaken by the Improvement and Development Agency (IDeA, now part of Local Government Group LGG) . The purpose of the platform was to encourage connections between people and organizations working in the local government sector and to improve the way they work through capturing and sharing know-how. Versatility and expandability were priorities in the development process. The platform was designed to support any number of individual communities of practice and enables its users to communicate and collaborate with each other on issues of common interest or purpose. Each community can be available to the public (meaning that anyone registered on the platform could join) or private (users request to join and the community facilitator approves their membership). Another important issue was accessibility, as the platform needed to be usable by staff across local government using divergent technology (both in terms of internet connection speed and browser capability). The platform’s primary focus was not, therefore, to be fully featured from the start, but to evolve in functionality in response to its users. Taking a community based approach to knowledge and information sharing that incorporates a conversational dynamic consistent with social media and web 2.0 principles. Creating fluid knowledge bases where good practice can be developed by the community, as opposed to having static downloadable content produced by self-proclaimed ‘experts’. Providing a space for ideas to be nurtured and projects to be completed collaboratively. Increasing the value of existing networks by providing an online space where community members can interact when not physically meeting. The strategy was supported by a team of five full-time knowledge management professionals, specifically responsible for embedding this programme into the enterprise and rolling it out into the sector at large. The team was charged with increasing awareness of and engagement in the communities of practice. They accomplished this task by developing a facilitator base that was informed, fully engaged and willing to experiment and be creative in the running of their communities. To this end, potential facilitators were identified through leadership in the local government sector and through existing work in the social media and Web 2.0 space. Many facilitators volunteered themselves in response to publicity about the programme. Since its launch in 2006, the local government Community of Practice platform has grown to support 95,000 users and over 1,500 communities (or domains of knowledge). On one level this can be deemed to be hugely successful, though the raw statistics hide a number of issues, as described in the Triggers. Over 90% of the users are government officers, or practitioners. There is very little engagement by senior managers, heads of departments, councilors or chief executives. Only 20% of the total number of communities is recognized as being active. The majority has either too few members (20 or less), which results in fairly narrow and limited perspectives, or lack effective (if any) facilitation/moderation, which could help stimulate and drive the conversations and interactions. Evidence gathered over the past 2-3 years seems to indicate that communities with more than 150 members are more likely to thrive whereas the smaller communities soon exhaust discussion and struggle to maintain interest. This does appear to correlate with the network effects described in both Reed’s Law and Metcalfe’s Law. About 80% of the communities have been set up as ‘private’ spaces, which has the effect of creating a series of knowledge silo’s, where any conversations and shared learning opportunities are strictly limited to the members of the private space. Clearly there will be some sensitive topics that require privacy, but this would not account for the relatively high number we are seeing. There may be a deeper cultural issue at work here, particularly if there is a sense of distrust or competition between departments, councils or regions. The large number of community spaces (1,500 and growing at a rate of about 60 per month) reflects the increasingly granular nature of the knowledge domains and the trend towards ‘atomic level’ conversations. The communities become closed and inward looking; boundaries are stiff and impermeable; opportunities for new perspectives are lost. Tribal effects appear to deter these communities from combining or consolidating and consequently it is quite common to see several communities independently coalescing around very similar topics or knowledge domains. The growth of Web 2.0 (social technologies) over the past 2 years has created a situation where it is now requires very little skill or resource to set up a new social network or blog. This has stimulated the trend towards ever-more granular and disaggregated conversations referred to earlier. The paradox is that the easier it becomes to disaggregate topics and conversations, the more we want to have an aggregated perspective in order to identify trends and pick up key signals. Hence the increasing popularity of hashtags and activity stream aggregators such as Tweetdeck. We have moved from data scarcity to data abundance over the past 2-3 years, particularly with the opening up of government data. This has created opportunities for delivering value-added services to the public, e.g. crime rates mapped against post/zip codes, school exam performance mapped against various demographic data, and spending comparisons by local authorities, etc. The public now expects complete transparency and accountability by all public sector organizations in order to be sure that they are getting value for their money (council and government taxes). Local councils are seeking ways of delivering more for less, and are more willing to compare performance with each other, and find common benchmarks for the services they deliver. In essence, data analysis has become increasingly important in finding savings and making critical decisions on how and where money is spent. Combining access to data tools and facilities with learning communities and data experts is a natural progression for the next generation community of practice ecosystem. The social software market has rapidly evolved over the past two years in response to the demand for a coherent way to support information creation and sharing, team communication and coordination and communities and informal social interactions. Either love it or hate it, Facebook has pushed the boundaries for user-centric social connectivity and information sharing and raised the expectations of workers who now expect similar capabilities from enterprise systems and intranets. The original Community of Practice platform and environment, conceived in 2005 and delivered in 2006, was innovative at the time, but is beginning to fail many of its users, who are now considerably more “social network savvy”. Communities of Practice has a steady demand for traditional teaming and sharing of knowledge assets, but social technology is now promising much richer social interaction and access to ‘just in time’ knowledge and information. Document repositories of tired case studies are giving way to more dynamic knowledge management techniques. After all, why read up on a case study when it can be just as easy to find, connect and collaborate with those who produced it in the first place? Even some of the language is getting in the way; thinking back 2 or 3 years, there was a fairly clear distinction between 'communities of practice' and 'social networks'. A gross over-simplification of course, but we can perhaps think of CoPs as functioning as a collective "we" and social networks being more about individual needs and personal interactions. It is apparent that this distinction is becoming increasingly irrelevant, and that we should think of both as being social structures which offer opportunities for sharing and learning. To this end we wanted to create a new ‘Knowledge Ecology’, consisting of an integrated blend of social media, decision support using sophisticated analytics and data visualization techniques, and training and re-skilling of local government staff to make more effective use of the social web for collaboration and knowledge sharing. We wanted a system that would overcome the preponderance of knowledge silos that had stiff and impermeable boundaries, and move towards less formal methods for growing and developing collaborative spaces, e.g. using functions such as "follow," "friend," "like," connect," "chat," or "subscribe," that link people to one another. By doing so we would encourage the redrawing of boundaries and bring in fresh perspectives to these spaces. This would contribute an element of randomness because each new connection will bring with it a network of other connections that can affect the community and what it does together. We also wanted to deliver a far more personalized experience for users, where information can find the user rather than the user finding the information. A system that caters for the needs of the individual. We’ve come to expect this from services such as Amazon and social networks such as Facebook, and more recently, Google+, so it seems a logical step to introduce the same capabilities into a ‘business’ social media platform. The technology component for this new Knowledge Ecology is the ‘Knowledge Hub’. Building on the success of the Local Government Community of Practice initiative, the Knowledge Hub will provide an even richer set of tools, features and capabilities to support collaborative working, knowledge discovery and knowledge sharing. Developed on an open platform using open source components, the Knowledge Hub offers unparalleled flexibility for future development, enabling local authorities to commission or develop their own applications for delivering value-added services to local communities. Critically, it will help facilitate local government led approaches for increased data transparency with tools to support the publishing of open and linked data into the public realm in ways which provide real benefits to citizens, business, local authorities and wider data community. Deployed on open source software and published under a GNU General Public licence. The Knowledge Hub is being rolled out to users from July 2011 (Beta) and should be fully implemented by end of 2011. The biggest challenge will be the migration of 95,000+ users and the community content (knowledge assets) to the new Knowledge Hub platform. A technical solution has been developed to transfer content whilst maintaining data structures and relationships. However, the key part of the process is ensuring the users can immediately adapt to the new environment. This will be achieved by use of intuitive interfaces, guided navigation, context-sensitive help and a dedicated support team for query handling. For some the whole social networking ecology is a completely new way of working. Identifying and connecting with peers working on similar projects, or finding experts in various disciplines suddenly becomes a whole lot easier. We recognize that for many senior managers, chief executives and councilors, any sort of social technology is a place to avoid and distrust. It is not anticipated that the new platform will significantly change these attitudes, but there will be new facilities that enable tighter integration between email (still the medium of choice for most managers) and the Knowledge Hub, i.e. lowering the bar for engagement with groups and communities using the Hub. However, motivating and educating a predominantly mature and skeptical staff demographic on the merits of social technologies is an on-going challenge. We also anticipate significant skepticism and reluctance to go ahead with social software deployments from those responsible for security, compliance, enterprise architecture and risk management. These will be addressed during implementation, and any specific usage policies can be accommodated. Increase opportunities to turn data into information, providing better decision support and reducing time spent on research. Generate new and faster practice, which is appropriate, transferable, and repeatable. Peer-reviewed content, people tend to trust content if it has been recommended by people they know or trust. In the same way, the Hub will enable users to comment on and recommend content and services that they have found useful. Increased thought leadership across the local government sector. Reducing time spent to identify and find resources/points of contact. Facilitate easier /faster sharing of experience; information will be promoted to users based on their profile activities and needs. Key conversations and ‘hot topics’ visible from the Home page, giving insight into important issues. Powerful semantic search and results clustering giving insight and information according to topic or service categorisation. Personalised dashboard views providing relevant information according to self-selected criteria, e.g. job role, location, expertise, project name etc. The system will provide authorities with an online facility to collect and reflect on the data on performance metrics and leading practice. Access to data intelligence for councils to submit and compare data, enabling users to benchmark performance and identify opportunities for improvement. A ‘mash-up’ centre for developing value-added applications and data visualisations that reveal new information. Increasing the means for practitioners within the sector to develop and share practice (‘helping others to help themselves’). More effective consultation using a blend of online and traditional survey techniques. Tools and facilities for publishing open and linked data in order to meet Government directives for publishing council performance and expenditure data. New facilities for comparing datasets – e.g. expenditure on specific council services. Through semantic search and community facilitation, similar efforts can be surfaced at local authority, regional and national level. Enabling limited resources to be maximized and duplication to be reduced. A scalable platform supporting free communications and a rich collaborative environment suitable for on-line conferencing, video conferencing and instant messaging. Online conferences on the communities of practice platform are generating savings of over 250% per event in production and travel costs without counting the advantages of more flexible use of officer time and permanence of learning. Tools for creating and publishing data/information mashups saving councils from needing to invest and develop their own. Potential to replace or supplement a council’s intranet, delivering people and expertise finder, diary/calendar management, project workspaces and facilities for publishing local news and events. Integrated web services to support customer contact and customer relationship management. Opportunities for reducing transactional costs in ICT services, and due to reduced traffic volumes through other ‘touch points to authorities, reduce costs in call centre and walk-in centre management. Opportunities to reduce HR training and development budgets through the sharing and self-learning resources. User Comments (legacy platform). Users will be surveyed and results compared once the transition to the new Knowledge Hub platform has been completed. "As a chief executive I tend to think of it (Communities of Practice) as a way of expanding my organization, because now I can ask somebody a question about leadership and development in the region and they can go off and talk to other people on the Communities of Practice and come back with an answer. So we are expanding our own organization’s boundaries to actually help each other across the region”. The legacy CoP platform has served us well over the past 5 years, and has clearly answered a need for closer cooperation, collaboration and knowledge sharing across the public sector. However, opportunities for wider engagement have been lost due to the lack of permeability between the rigid boundaries of the CoP platform and the vibrant conversations taking place on other (external) social networks, including the blogosphere and twitterverse. The Knowledge Hub will make it far easier to include and integrate these external sources. There is also the cost of maintaining a purpose-designed (bespoke) community platform at a time when there are far more flexible and cheaper options available in the open source community. On-going costs for maintaining the new platform will be significantly cheaper, and adoption of open standards (e.g. OpenID, OAuth, OpenSocial) will ensure the platform remains viable with emerging solutions in the open marketplace. A training course for new facilitators, covering both the principles of facilitating online communities and an introduction to the features of the CoP platform. 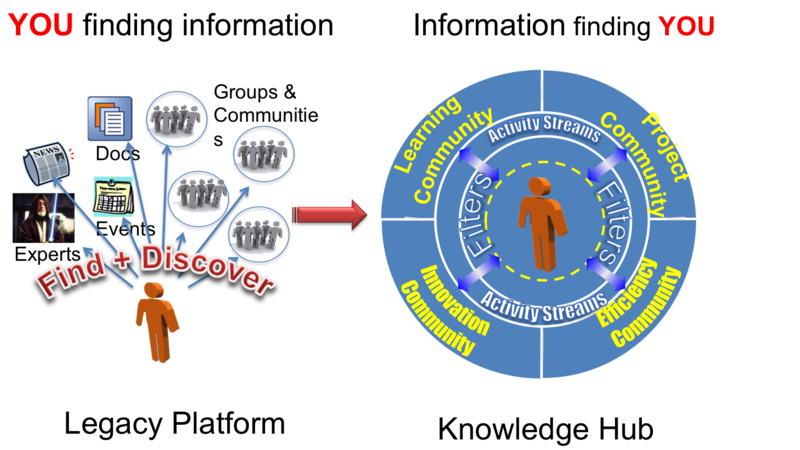 A meta-CoP for community facilitators, which was the first community to be created. This CoP provides a relaxed informal area for best practice to be shared and developed. Workshops for facilitators, which involve a mixture of community facilitation guidance and technical training on the platform itself. These have involved expert speakers from outside the public sector. Guidance documentation in a number of formats, from presentations to longer case studies and advice. Short guides to CoP functionality that the community itself has developed. Users and facilitators alike refer to these guides. The role of the facilitator/moderator will be retained and encouraged as part of the emerging knowledge sharing strategy for the sector. With over 95,000 users, growing at a rate of around 1,500 new users per month, and more than 1,500 communities of practice (or socially networked groups), the local government community of practice platform delivered in 2006 can be considered a successful project. There is clear evidence of sector-wide collaboration and sharing of good practice. Measurable efficiencies and cost savings are evident where on-line conferences have been arranged in preference to traditional face-to-face events. Less tangible (i.e. difficult to measure) benefits include the value of fluid knowledge sharing in a trusted and secure virtual environment. Just now reflecting on this story and thinking about the difference between having a fairly innovative idea, and the practical (and political) issues that stand in the way of implementing it. At the time of writing this story (October 2011) I had a clear vision about what this project could do in terms of delivering improvement for local government services in the UK by tapping into the collective genius of the staff and partners working in the sector. The austerity policies of central government gave added impetus to the need for all local councils to do more with less, and this project was established with this goal in mind. How to free-up knowledge and encourage innovation were, and still are, elusive goals to the control-driven and hierarchical structures of public sector organisations. Building on the lessons learnt from the (now legacy) communities of practice platform - where there was no place for hierarchies and command and control structures, this project would have tapped into the emerging benefits of using open and linked data to creata a "semantic web" of public sector knowledge. And all of this delivered long before the idea of Google's "Knowledge Graph" became the new buzz. So what happened? The budget was cut; the project team was decimated; there were new managers; different priorities; a focus on technology skills over people skills. In short, the long-term vision was lost. This story is all that remains of the original vision. Perhaps one day someone will emerge to carry it forward. I live in hope!